If you’re living in a Spanish speaking country, or if you simply speak or understand Spanish, don’t misunderstand the word written on this small wooden stick. 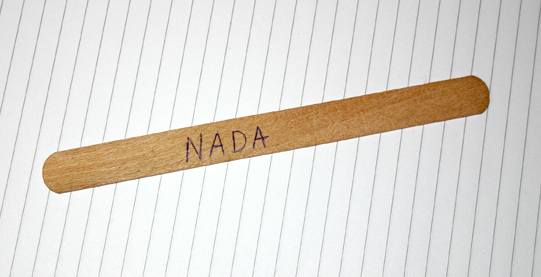 Even though “NADA” means “NOTHING” in Spanish, in Serbian it means “HOPE”. How can this very same word have two so much different meanings in two different languages is a question that has only recently occurred to me. It’s truly amazing how something that means nothing to some people can still mean even everything to some other people, for hope is sometimes everything that you’re left with when all else fails. When you speak your own language, you hardly ever think about the origin of words or the structure of sentences, unless you research linguistics. Usually you simply use your language every day to convert your thoughts into communication messages and spread them to the world around you for some reason. Perhaps you want to explain something or you need to be understood; maybe you want to get something, or simply channel your emotions. Basically you want to reach out to the others and you need a tool for that. This is what languages serve for. When you start learning a foreign language, especially at an older age, you’re much more prone to the analysis of those first awkward words and phrases you’re more or less successfully putting together. Those incomprehensible strings of sounds or letters usually begin to remind you of something that you already know so that you can create associations, or you simply dissect words into smaller pieces in order to memorize them in an easier way. You’re aware that you’re dealing with something both strange and foreign to you (stranger doesn’t have to be strange 🙂 ) and you’re looking for a way to make it sound more natural and familiar. As you make progress on this amazing path, newly acquired familiarity of those previously unknown linguistic terms grows stronger and your job of expressing yourself becomes easier, up until a day comes when you realize that the foreign language lost something incomprehensibly magical about it that used to be there at the beginning, that something that set you on this journey at the first place. You might not consciously know it, but that’s the moment when you instinctively realize that the foreign language has become for you just another tool in the big bag of useful things that help you live this life, simply another way to say that same thing that has been materializing itself in some corner of your mind. This is more or less what happened to me as well with Spanish and all other foreign languages that I speak or understand. When I say or read “NADA” in Spanish, it automatically means “NOTHING”, while on the other hand in each and every context of my native Serbian it has always been and always will be only one thing – HOPE. Now what’s the word hope doing on some silly wooden stick, you’ve surely been asking yourself by now. It’s a result of a phone call I had this evening with my aunt, person I very rarely speak to and person who knows very little about my life, my dreams, problems, interests, goals… She doesn’t truly realize how hard it is even for perfectly sane people to live in the crisis ridden Serbia of today, let alone how even much harder this can be for those suffering from any chronic illness. She thinks that I have some good job and some satisfying salary (this happens when you have to hide PD from your family) and she usually asks if everything’s ok at work. Tonight I replied that nowadays here in Serbia it is much harder than it used to be, to which she replied that I have no right to complain as it’s that way everywhere in the world, no one is immune to crisis. Maybe, but also maybe not, I answered. If everywhere in the world things were exactly the same, people would stand equal chances to accomplish things in life, which means that they would then never move just for the sake of having a better life. If that were true, her son would be living in Serbia today, together with all other talented, educated, special people who left this country for good. She added that even though things were not good here, we must have hope. Because you know how they say, hope dies last. Yes, great saying, I replied, but you know what, if it really dies last, then it means that after everything else dies, hope will eventually have to die as well. It dies last, but still dies, right? Hey, she shouted, how can you say things like that, we must have hope, we simply must have it, because if a man has no hope, man dies. To avoid further unpleasant debate on whether then man equals hope as man dies when hope dies, in which I personally don’t believe :), I simply agreed that we must have hope and I promised to be hopeful, after which our conversation drifted in some direction totally irrelevant for this blog and eventually ended with best wishes for some better future. I hung up and realized that I definitely don’t have any more hope for some better working environment in my country, yet I’m still not dead. How can one have hope in a place that has been artificially kept alive for almost 25 years, years of sanctions, stellar inflation, horrific economic crises, place where homes and lives were destroyed in bombings at the end of 20th century? How can you have hope in a country of people with permanent physical and psychological scars, country whose boundaries have changed so many times in my lifetime and are still changing in this last, seemingly terminal phase of extremely unsuccessful transition? I know that there is always hope in people’s hearts, but even hope gets consumed, it’s not infinite. It also comes with an expiration date, usually the better was the shape you were in when you started hoping, the longer you’ll endure bad things and consequently the longer your hope will last. But at some point if you have unsuccessfully hoped for too much time (and believe me, 25 years is a pretty long time), you’ll have to ask yourself if there is any sense in doing it any longer. It’s a rational, logical conclusion in given circumstances, yet people feel they must consider you crazy if you decide to give up hoping. While I was contemplating on all this, my hand ended up in my sweater jacket’s pocket and touched the familiar wooden object. It’s not just about any piece of wood, it’s actually a medical spatula used for examining patients’ throats, one of many new, unused spatulas we have at home, which my father brought from work when their sterilization dates expired. They were no longer good for people’s mouths, but they are great for mixing something, or for just about any other domestic purpose you can think of. Now what was this particular spatula doing in my pocket? I live in an apartment building on the second floor, which in my case means that I need to go up and down 5 entire flights of stairs to get in or out of my living space, so I often use the elevator. It’s been more than two months since the elevator’s outer door can’t close properly to ensure that it can normally move up and down away from my floor. We’ve been calling, asking and literally begging the maintenance service which we pay pretty dearly every month to come and fix it, but nobody seems to care. We warned them that this is also a potentially dangerous situation and that someone might get hurt, but still nobody cares. We’re in the middle of the crisis. There is not enough money for the spare parts. Call only if the elevator doesn’t move AT ALL. If instead it’s still moving “somehow”, it means that it’s still working, so goodbye and have a nice day. So what do I do? I enter the elevator, the outer door closes on its own, I close the inner doors and push the desired button. I hear the familiar “click” sound, but the elevator doesn’t move. I take out the spatula from my pocket, stick it into a narrow space between the inner doors and thus make some pressure from inside on the outer door, slight pressure which is just about enough to move it a bit and create the necessary closing contact which sets the elevator in motion. And this is what I’ve been doing every single day for more than two months, because 5 flights of stairs are not always an easy option for someone in my health condition. The feel of that wooden stick in my pocket set a wave or ironic, nervous, miserable laughter. I laughed out loud like crazy for a minute or two. Then I took out a ball point pen and wrote “NADA” on it. For if it is sane and acceptable to have hope in a country where you have to carry spatulas around to set elevators in motion, then I’m an irreparably delusional human being. But hey… let’s hope… to begin with, for the return of Hope.